Bishop Martin N. Lohmuller, retired auxiliary bishop of Philadelphia and titular bishop of Ramsbury, died Tuesday afternoon, Jan. 24 at the age of 97. He was the oldest living Roman Catholic bishop in the United States. He died at St. Joseph’s Manor in Meadowbrook, Montgomery County, following a lengthy illness. The funeral rites for Bishop Lohmuller will take place Wednesday, Feb. 1 in the Cathedral Basilica of SS. Peter and Paul. The bishop’s body will lie in state at the cathedral from 10 a.m. to 1:30 p.m. that day. The solemn funeral Mass will begin at 2 p.m. and immediately following the Mass, the Rite of Committal and interment of the body will take place in the Cathedral crypt. A live streaming broadcast will be provided by the Philadelphia Archdiocese at www.archphila.org beginning at 1:30 p.m.
Bishop Lohmuller was ordained a priest for the Archdiocese of Philadelphia on June 3, 1944 by Bishop Hugh L. Lamb. He was named an honorary prelate to his holiness, then-Pope and now-St. John XXIII, with the title of monsignor on May 18, 1959. He was ordained a bishop by the late Cardinal John Krol on April 2, 1970. Martin N. Lohmuller was born to the late Martin and Mary (Doser) Lohmuller on Aug. 21, 1919. He grew up in the Hunting Park section of Philadelphia and attended the former St. Henry School in North Philadelphia, then heavily German in character and reflecting his national heritage. After attending Northeast Catholic High School for two years he enrolled at St. Charles Borromeo Seminary. After priestly ordination he earned his canon law degree at the Catholic University of America. He then was assigned to the Harrisburg Diocese which was in need of a canon lawyer. During his years there he was instrumental in forming the Pennsylvania Catholic Conference in 1953 to establish ongoing dialogue between representatives of the church and elected officials in the state capital. Returning to Philadelphia in 1970, Bishop Lohmuller worked closely with Cardinal Krol on a number of major initiatives until the cardinal’s retirement in 1988. The bishop oversaw the planning and construction of the current Archdiocesan Pastoral Center, which houses the central administrative offices of the archdiocese. Prior to its completion in 1971, administrative offices had been spread out in smaller buildings and converted homes in Philadelphia. 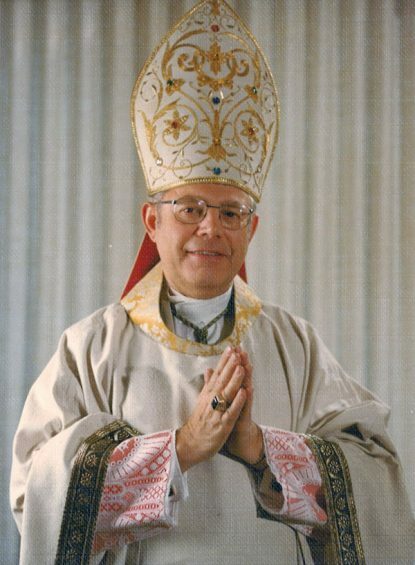 Bishop Lohmuller played a major role in the success of the International Eucharistic Congress hosted by the archdiocese in 1976 and the visit of then-Pope, now-St. John Paul II, in 1979. Later, Bishop Lohmuller managed the founding of St. Martha Manor, the first Catholic nursing home in Chester County. He also served as pastor of Old St. Mary and Holy Trinity Parishes in Old City Philadelphia. While he officially retired at age 75 in 1994, he maintained a busy confirmation schedule for the next decade. He spent the final years of his retirement in residence at St. Cyril of Jerusalem Parish in Jamison, Bucks County. Watch CatholicPhilly.com for an in-depth obituary with comments from the friends and family members who knew him best. They reflect on his achievements and ministry over an extraordinarily long and fruitful life.